This article originally appeared in the National Defense University’s Joint Forces Quarterly 80, and is republished with permission. It can be read in its original form here. Forces postured forward for deterrence and conflict prevention are a substantial component to U.S. global engagement. The combatant commanders, joint community, and Services are working together to plan and resource this joint force with credible, effective, and affordable warfighting capabilities that assure friends and deter adversaries—should deterrence and conflict prevention fail. Complicating the combatant commanders’ calculus are the advancing antiaccess/area-denial (A2/AD) capabilities in the hands of potential adversaries and rogue states that pose a major challenge to the maritime domain. From the Arctic to the Arabian Gulf, Russia, North Korea, China, India, Pakistan, and Iran all have to varying degrees either deployed or are developing nuclear weapon and ballistic missile capabilities. Combined with other A2/AD capabilities that include sea-skimming and high-diving supersonic cruise missiles, these threats to the global maritime commons translate into powerful tools for diplomatic coercion. Senior military officials conceive of high-end operations as IAMD-centric. They view IAMD as a joint capability to be employed at the tactical, operational, and strategic levels of war. Competitive IAMD strategies for today’s A2/AD environments are comparable to those strategies formulated during the Cold War with reference to the Fulda Gap, such as the Follow-on Forces Attack subconcept. The strategies inform IAMD requirements generation and acquisition, as well as the Planning, Programming, Budgeting, and Execution process for systems and architectures. Joint IAMD describes the IAMD environment as an expanding battlespace requiring plans and operations that range across global, regional, transregional, and homeland domains. “The regional and intercontinental reach of ballistic missiles,” it continues, “alters the strategic and operational decision space.”3 IAMD forces in a specific theater can extend to regional, transregional, and homeland operations. As such, combatant commander plans must allow for coordination and handoff across combatant command areas of responsibility. 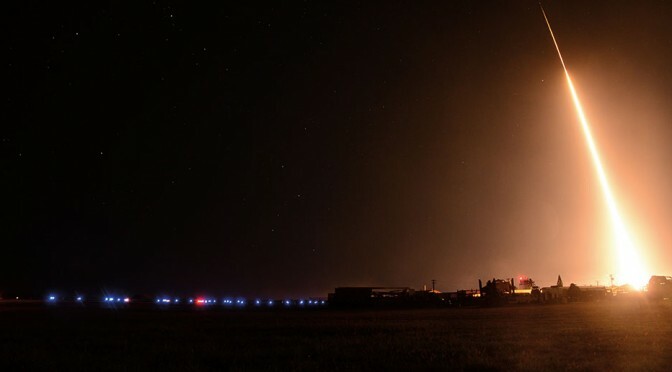 Since May 2013, the Missile Defense Agency (MDA) has had technical authority over the IAMD mission. MDA now leads all joint IAMD engineering and integration efforts, including defining and controlling the IAMD interfaces and the allocation of IAMD technical requirements. MDA’s current director is Vice Admiral James Syring, the first Navy head of the agency. His arrival in 2012 coincided with a time when the Aegis ship-based combat system came to be seen as a core element of U.S. and partner nation efforts in ballistic missile defense (BMD) in line with the European Phased Adaptive Approach (EPAA), the administration’s missile defense strategy for Europe.4 Syring previously served as the program executive officer for integrated warfare systems (PEO IWS) in the Navy office that was responsible for modernization of Aegis cruisers and destroyers, new construction, and ongoing baseline upgrades to their combat systems. Working with MDA in driving IAMD jointness is the Joint Staff’s Force Structure, Resources, and Assessment Directorate (J8), specifically the Joint Integrated Air and Missile Defense Organization (JIAMDO). This group leads in developing and fielding a comprehensive, integrated joint and combined air and missile defense force in support of Joint IAMD. Since June 2014, JIAMDO directors have been two other Navy flag officers, Rear Admiral Jesse A. Wilson, Jr., and his recent successor, Rear Admiral Ed Cashman. They have led JIAMDO in planning, coordinating, and overseeing joint air and missile defense requirements, operational concepts, and operational architectures. They have also headed the U.S. delegation to the North Atlantic Treaty Organization (NATO) Air and Missile Defense Committee that develops and steers Alliance IAMD policy, all the more important in view of the current situation in the Eastern Mediterranean. The linchpin of regional IAMD is surface warfare, then-Captain James Kilby wrote in April 2014.5 The deputy for ballistic missile defense, Aegis combat systems, and destroyers in the Office of the Chief of Naval Operations (OPNAV) Surface Warfare Directorate (N96), Kilby explained that the surface Navy’s fleet of 30 Aegis cruisers and destroyers is capable of conducting ballistic missile defense. His main points, however, addressed how a host of additional Aegis ships are undergoing modernization and will be equipped with a new combat system baseline that provides advanced IAMD capabilities. Now a rear admiral, Kilby became the first commander of the newly established Naval Surface and Mine Warfighting Development Center in San Diego in mid-2014. Prior to his OPNAV service, he commanded the cruiser USS Monterey (CG 61), the first Aegis BMD ship to deploy to the Mediterranean in March 2011 to support EPAA. Kilby stated that the key feature of Aegis IAMD modernization is the Baseline 9 combat system upgrade that provides the ability to conduct integrated fires via a sensor net linking ships and aircraft. Four Baseline 9 ships—two cruisers and two destroyers—underwent certification in 2015. An additional BMD destroyer, the lead Baseline 9 destroyer USS John Paul Jones (DDG 53), is homeported in Hawaii. In August 2014, the John Paul Jones replaced the Aegis cruiser USS Lake Erie (CG 70) as the deployable BMD test ship assigned to the Barking Sands Pacific Missile Range Facility on Kauai to support MDA and Navy testing of IAMD capabilities. (The John Paul Jones Baseline 9 upgrade was co-funded by the Navy and MDA. Although the ship is an “integrated baseline ship” that is also deployable, it is not a combatant command asset.) John Paul Jones has to date successfully completed four flight test events intercepting both short-range ballistic missile and cruise missile targets using the Standard Missile (SM)-6 Dual I and SM-2 Block IV missiles. OPNAV’s Surface Warfare Directorate is working to enhance the utility of NIFC-CA. Among the concepts considered is making the Baseline 9 ships less reliant on assets of the carrier strike group by using an organic unmanned aerial vehicle with the necessary data links to provide the tracking and targeting information to the ship’s system as a way forward for Aegis in its IAMD role. In 2013, then–Chief of Naval Operations Admiral Jonathan W. Greenert directed the Service to accelerate NIFC-CA’s fielding, achieving IOC of Increment 1 with the E-2D in 2014. 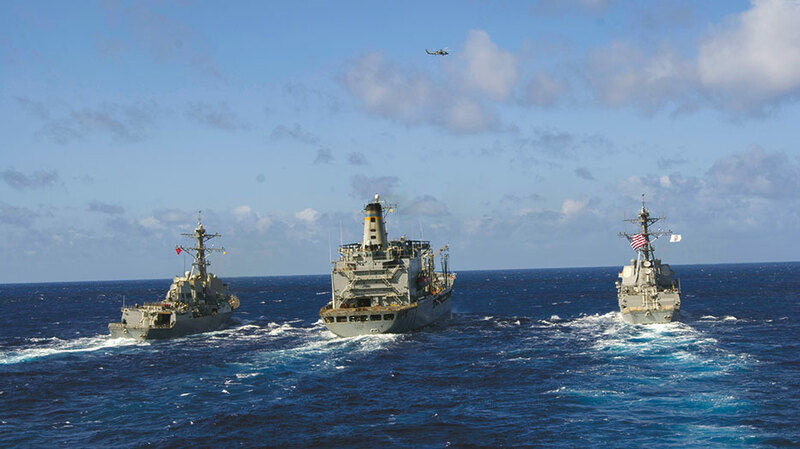 The Theodore Roosevelt carrier strike group deployed with a squadron of E-2Ds and the USS Normandy (CG 60), a Baseline 9 cruiser. The lead Baseline 9 cruiser, USSChancellorsville (CG 62), is now under operational control of U.S. 7th Fleet. The third Baseline 9 cruiser, USS Princeton (CG 59), underwent combat system ship qualification trials and integrated testing in July 2015. The initial NIFC-CA concept of operations, however, still requires additional testing and refinement as the Navy delivers the tactics, techniques, and procedures (TTPs) needed to exploit the new IAMD capabilities. While the Baseline 9 cruisers go by the name “air defense cruisers,” the Baseline 9 destroyers will be full-up IAMD Aegis ships with both NIFC-CA and BMD capabilities. The Baseline 9.C1 destroyers USS John Paul Jones, USS Benfold (DDG 65), and USS Barry (DDG 52) were slated to achieve Navy certification in 2015 with open architecture BMD 5.0 combat system computer software. Benfold is now on station with the 7th Fleet’s Forward Deployed Naval Forces in Yokosuka, Japan. Barry will follow by 2017. Based on the tactical threat picture, Baseline 9 Aegis destroyers will be able to allocate their computer resources more dynamically in a single computing environment to maximize their BMD performance without degrading their air defense role. The principal enabler of this capability is the multi-mission signal processor (MMSP) for the Aegis SPY-1D radar. Earlier BMD computing suites for the radar used a separate signal processor, meaning a BMD-equipped surface warship could engage either a ballistic missile or an aircraft/cruise missile threat, but not both threats simultaneously. This situation resulted in difficult trade-offs that limited the system’s anti-air warfare (AAW) capability to an unknown extent. The MMSP, however, effectively integrates signal-processing inputs from the BMD signal processor and the legacy Aegis in-service signal processor for the radar. This integration enables the SPY radar to go from single-beam to dual-beam capability to meet the power resource priorities for simultaneous anti-air warfare and BMD sector coverage. The MMSP’s up-to-date commercial off-the-shelf hardware and software algorithms control radar waveform generation and allow for simultaneous processing of both AAW and BMD radar signals. Critically, the MMSP improves Aegis SPY radar system performance in littoral environments, for example, against sea skimmers in a high-clutter environment. For BMD, the processor also enhances search and long-range surveillance and tracking and BMD signal processor range resolution, discrimination, and characterization, as well as real-time capability displays. The Navy’s PEO IWS strategic vision for Aegis modernization is simple. Smaller and more frequent upgrades to modular combat systems with open architecture and standard interfaces will best enable the surface Navy to maintain operational superiority in support of the joint force in the A2/AD environment. Aegis baseline upgrades strive for commonality to reduce the combat system footprint onboard ships. Future baselines will bring additional IAMD capabilities, notably, integration of additional off-board sensors as the joint force “sensor-shooter” networks mature and A2/AD counters in the access environment. A key developmental focus is determining what other off-board elements can integrate into the fire control loop and federated network to increase overall affordability and lethality. The good news is that the question of how to share data is no longer a “cultural issue.” The Joint Integrated Air and Missile Defense Organization is helping to forge strong relationships across PEO IWS, MDA, combatant commands, and the Services. The bad news, however, is that going from interoperable to integrated systems that seamlessly share data will require investments in systems testing and evaluation among the Services. The era of declining defense budgets and increasing demand from combatant commanders for capacity as well as capability provides impetus to leverage efficiencies with joint and possibly Allied systems. “Importantly, IAMD will need to be even more Joint—advancing interdependence and integrating new capabilities,” states the Joint IAMD.6 Affordability is key to the joint IAMD vision for fielding more systems. The JIAMDO Vision and Roadmap describe the “to be” goals and desired states of IAMD in 2020 and 2020–2030, respectively. Not anticipating a quantum leap to interoperability, JIAMDO is working closely with MDA’s IAMD technical asessment to determine what interoperability is possible given Service budgets and willingness. Modernized Aegis cruisers and destroyers will plug into the strategic-level network of national sensors for missile defense. This sensor-shooter net will ultimately provide them with a flexible, combined launch-on-remote/engage-on-remote capability along the area and regional missile defense continuum, potentially extending to select homeland defense missions in the future. The potential for further IAMD sensor-shooter networks to counter A2/AD capabilities is leading both combatant commanders and JIAMDO to focus on track correlation and data links. From an Aegis-platform perspective, the farther out the sensor-shooter mix, the more crucial the resolution of track correlation issues. 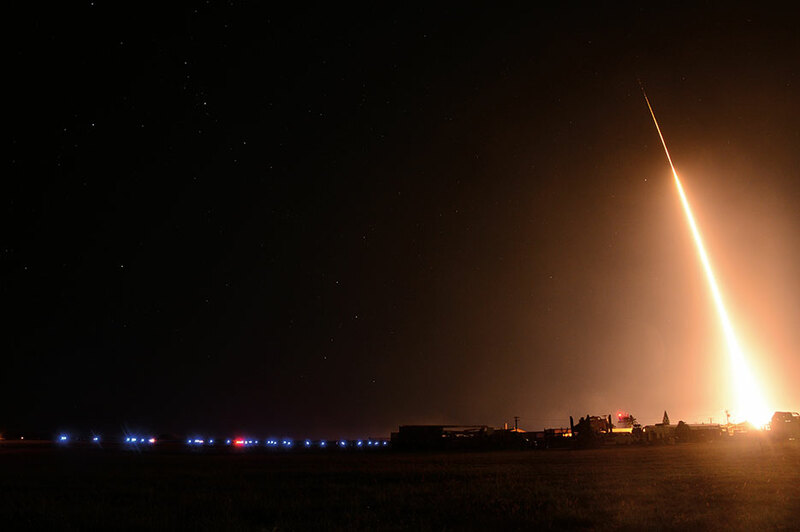 Tracks and data are provided, for example, by Link 16, CEC, and the Command and Control Battle Management and Communications network, the integrating element of the ballistic missile defense system. JIAMDO has been pushing the Services to share common tracks for a shared-picture, integrated fire control (IFC) and operational-level joint engagement zones (JEZs). JIAMDO funds and runs exercises for combatant commands and the Services to test TTPs for joint IAMD missions. The annual Black Dart exercises, for example, test countermeasures against unmanned aerial systems. Joint IAMD challenges JIAMDO to leverage ongoing efforts to improve the air picture (the common operational picture [COP] for wide-area surveillance and battlespace awareness), combat identification (CID), discrimination (for ballistic missiles), and IFC and battle management, for example, via automated battle management aids (ABMA). Having embraced the joint IAMD vision, the Office of the Secretary of Defense and combatant commanders have accepted localized JEZ integrated air and missile defense. JIAMDO is thus active in developing its JEZ approaches and their COPs. Indeed, it regards COPs as one of the so-called pillars of IAMD, along with CID, IFC, and ABMA. JIAMDO has the responsibility for developing the IAMD operational architecture—the broad-based description of how things work conceptually over the entire IAMD mission area. A fully functional joint IAMD architecture supports execution of current and future concepts with operationally representative positions for these systems. Applying a systems-agnostic approach, a JIAMDO technical committee takes that architecture and then defines IAMD system requirements in concert with the MDA Joint Service Systems Engineering Team (JSSET), now that MDA has the responsibility over IAMD technical assessment. Having technical authority over IAMD missions, MDA approaches interoperability architecture first by building on legacy systems that will then inform ground-up design for future systems. 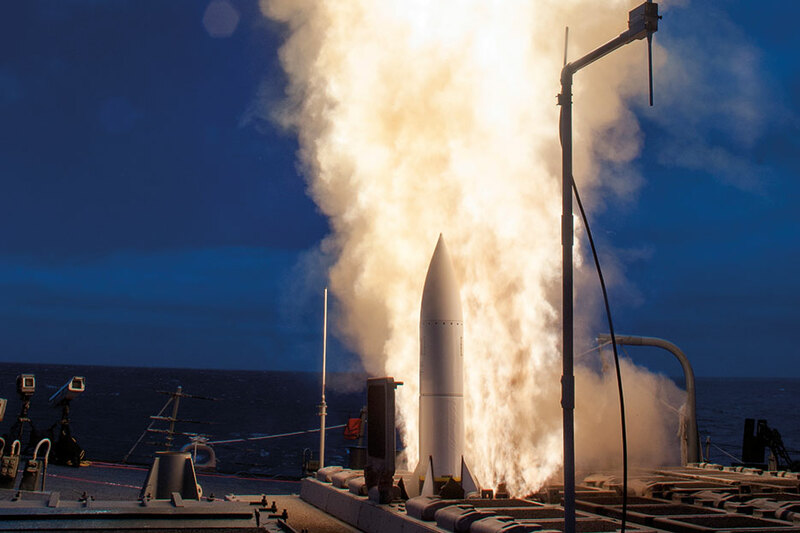 To execute the joint IAMD architecture requirements for Aegis, MDA works with its Aegis BMD component and the Navy’s PEO IWS 7.0 (Future Combat Systems). IAMD interoperability requirements also apply to the Army Terminal High Altitude Air Defense and Patriot missile systems, the Air Force Airborne Warning and Control System, F-15 and F-22 aircraft, the Navy E-2 and F/A-18 aircraft, and the Army Joint Land Attack Cruise Missile Defense Elevated Netted Sensor system, among others. The JSSET is the specific MDA entity that coordinates the work on the architectures. This team serves as a joint acquisition effort to build the future framework for the near-term joint track management capability (JTMC) and long-term joint IAMD capabilities. JSSET now has a business structure for outreach as well as traction for the system architecture products that are releasable to NATO Allies and industry for the requirements definition process. A priority product is the Army/Navy JTMC Bridge. JSSET is continuing development of the JTMC Bridge, which has been in the works for several years. Representing a successful translation of operational needs into joint requirements, the Bridge is in fact the only system architecture for an entire mission area. A hardware solution specific to connecting two systems—the Army Integrated Fire Control Network and the Navy CEC—the JTMC Bridge has the potential to enable additional kill chains. At this point, however, JIAMDO and the JSSET recognize the value of the Bridge. JIAMDO would like to see a broader, future-looking effort toward an IAMD-wide systems architecture based on the operational architecture. Studies are ongoing, including an operational benefits analysis and cost benefit analysis. Creating an awareness of the IAMD mission and the benefits of its proper utilization across the Department of Defense, to include the development of the enabling framework of concepts, doctrine, acquisition, and war plans that support full integration of IAMD into combat operations. Commanders must understand and embrace every weapon and tool available to them. John F. Morton is a Senior National Security Analyst for TeamBlue National Security Programs, Gryphon Technologies LC. 1 Sustaining U.S. Global Leadership: Priorities for 21st Century Defense (Washington, DC: Department of Defense, January 2012), 3, available at <www.defense.gov/news/defense_strategic_guidance.pdf>. Referencing U.S. engagement in the Asia-Pacific, the 2014 Quadrennial Defense Review speaks of “our commitment to free and open commerce, promotion of a just international order, and maintenance of open access to shared domains.” Quadrennial Defense Review 2014(Washington, DC: Department of Defense, 2014), 4, available at <http://archive.defense.gov/pubs/2014_Quadrennial_Defense_Review.pdf>. 2 Joint Integrated Air and Missile Defense: Vision 2020 (Washington, DC: The Joint Staff, December 5, 2013), 1, available at <www.jcs.mil/Portals/36/Documents/Publications/JointIAMDVision2020.pdf>. 4 Rachel Oswald, “Missile Defense Agency May Go in New Direction with New Chief, Advocate Says,” Global Security Newswire, August 8, 2012, available at <www.nti.org/gsn/article/missile-defense-agency-may-go-new-direction-new-navy-leadership-advocate-says/>. 5 James Kilby, “Surface Warfare: Lynchpin of Naval Integrated Air/Missile Defense,” Center for International Maritime Security, April 4, 2014, available at<http://cimsec.org/surface-warfare-lynchpin-naval-integrated-airmissile-defense/10748>. 6 Joint Integrated Air and Missile Defense, 1.